Camera lenses are expensive and if you’re like us, you can easily find really cheap lenses that your camera can’t use. [Sam] has a Canon EOS and a bunch of old-school FD lenses at his disposal. There’s one problem though: using these old lenses with an adapter means focusing at infinity is out of the question. Thankfully, he put up a few videos (part 1, part 2, and part 3) walking through the process of modifying an FD lens for his new camera. To do the modification for the FD lens, all that’s needed is some epoxy, a screw driver, and an M42 to EF adapter. After disassembling the back of the FD lens, [Sam] mounted the M42 adapter on his camera and held the lens up to check the minimum focusing distance. A bit of grinding or a few metal shims ensure that the lens is in the right position. The next step is making sure the aperture can still be controlled. [Sam] goes through this in part two of his video. A little bit of dremeling takes care of all the hard work. The lens is finally attached to the M42 adapter with a tiny bit of epoxy, and the conversion is complete. While [Sam] could have put up a few close up pics of his build, he goes through every step of the process very well. Check out the embedded videos after the break. 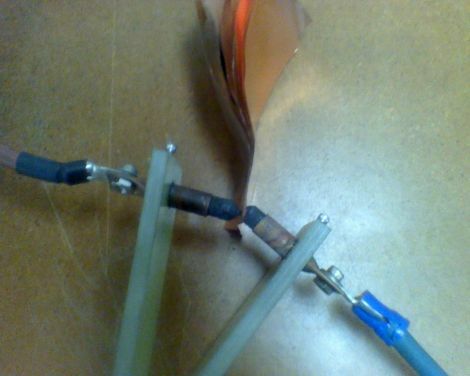 Hackaday reader [David] was looking for a cheap and easy way to spot weld copper tabs together. As he notes in his writeup, the properties of copper which are most enticing, such as high thermal capacity, make welding it all that more difficult. His home-brew method of spot welding is admittedly quick and dirty, but it does get the job done quite well. He started off with an array of four 2.5V @ 2600 Farad ultra capacitors, which provide the high current required to do copper spot welding properly. They are wired in series and connected to his electrodes using heavy gauge wire. The graphite-tipped electrodes were an interesting DIY job themselves, cleverly constructed using copper tubing and a graphite block. The most simple/dangerous/clever part of the whole rig is his trigger mechanism, which consists of a pair of copper blocks that he bangs together manually to complete the circuit. [David] is well aware that the setup is just a touch rough, but according to him it makes great welds, and it’s only a proof of concept at this point. He has a hefty list of improvements to make for the final version, including a different switching method among a few other safety precautions. 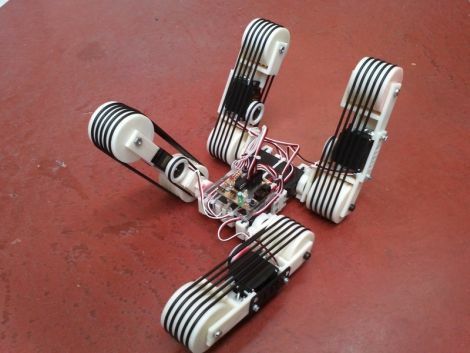 [Jon] has been developing a slick little RC robot in bits and pieces over the last year or so, which can constructed by anyone with access to a 3D printer. Servos and electronics aside, the entire thing can be put together in short order using the plans he posted on Thingiverse. The robot makes use of four “caterpillar” type bots, which are all connected via a central frame. Once [Jon] had the general design for a single caterpillar bot down, he moved forward to create the robot you see above. His friend [Julián] lent a hand in the form of electronics and code, which allows the robot to be driven using a standard USB gamepad. As you can see in the video below, the robot gets around nicely, climbing over obstacles with relative ease. While it is a bit loud, [Jon] says that’s due to the undersized servos they happen to be using at the moment. We think it looks great so far, but [Jon] already has plans to beef up the motors and add wireless control in the near future – we can’t wait to see it then! With the launch of Raspberry Pi approaching the development team released the details about the prototypes from about five years ago. The board was originally based on an ATmega644 and built on some perfboard. We call BS on the title of this one, but the goal of finding devices that don’t use disposable energy sources is a good thing in our book. For instance, can we get more stuff that uses long-life capacitors instead of batteries? Command adhesive for mounting bulletin boards, etc. This seems like a no-brainer, but we’ve been using nails to mount bulletin boards and white boards for year. The problem is, when you stick a push-pin in one side, the other side pops off of the nail. [Zhanx] is using adhesive from 3M Command Hooks to keep his stuck to the wall. [Navic] has been hard at work on this robot hand. There’s few details but he shows it can grip objects under one pound and he’s been taking amperage measurement during testing. It might not have been an emergency this time, but [Chris] did figure out a way to charge his cellphone after the snow storm in New England knocked out his power. He connected to lantern batteries to a 7805 regulator, then patched that into a USB hub to get his phone connected. Not bad in a pinch!